Happy Memorial Day Weekend! How are you planning on celebrating? I'm off to New Orleans for a few days and I'll be having quite a few delicious local NOLA brews. I know most of you will be drinking a handful (or a barrel's worth) of great beers... and I WANT TO SEE THEM! All weekend long, email your beertography to me at beertography@gmail.com with the subject line "Memorial Day Beer" OR if you're on twitter, just tag your photo with the hashtag #beertography and I'll compile them all. I'll pick my top 5 and then we'll have a vote on Facebook next week. The winner will get a special prize from yours truly. I'm not going to tell you what the prize is yet, but I promise you'll like it! So get to it! And Happy Memorial Day Weekend! It's an indisputable fact: Visiting local breweries is awesome. When I heard that Captain Lawrence in Pleasantville, NY was going to be moving to a new larger facility a few miles away, I knew I needed to plan a trip after visiting the original Pleasantville location quite a few times for release parties as well as their annual Anniversary Pig Roast. When discussing the idea of visiting the new digs with good friends Jeff and Pat, Jeff suggested that instead of taking the train or a car up to the brewery, we should try to make it a bit more interesting and ride our bikes the whole way up. After some brief google map research, we realized that it was only about a 35 mile ride from lower Manhattan. So we decided that we'd take a day off from work and hit the road. Or in this case, bicycle path. 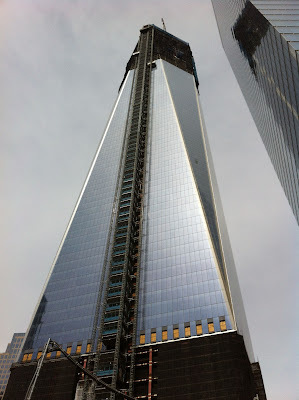 Since Jeff and Pat live in Brooklyn and I live in Jersey City, we decided the World Trade Center would be a good central starting point. It's close to the Hudson River Greenway which is a dedicated bicycle/runner route that runs the entire West Side of Manhattan. And man, it was the perfect day for a ride. 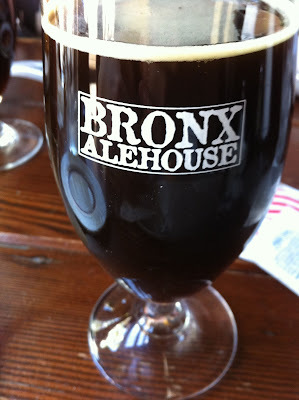 Our first of three major destinations was the Bronx Alehouse. I've heard many a good thing about this new-ish craft beer spot, but the majority of my visits to the Bronx usually find me at the unfortunately not close-by Yankee Stadium. So when I took a look at the route and realized we'd be passing within a block of this establishment, I insisted we make it our destination for lunch. This worked out perfectly, as not only were we absolutely starving by the time we arrived, but the food and drink were outstanding. We locked up our bikes and entered as I suggested to Pat and Jeff that we start off with a round of Bronx Brewery Pale Ale which neither of them had tried before. It's a fantastic pale ale and would be the perfect beer to quench our thirsts. I thought that it really hit the spot and my travel companions concurred. As for food, we got an order of wings which we promptly demolished. Jeff and I ordered the Pulled Pork Sandwich and Pat got the Pulled Pork Grilled Cheese.I also ended up getting a Kelso Sour Quad Bock Aged in Cabernet Sauvignon Barrels. Wow, just wow. The Bronx Alehouse is a great spot that you should absolutely seek out any time you're in the area. Maybe we can get them to open another one near the stadium? We continued north through Van Cortlandt Park which included a short stretch of unpaved bike path and was a bit muddy at points as it had recently rained (more details of exactly where this unpaved section occurs in the instructions on how you can take this trip yourself at the bottom of this post). For the most part it's a straight shot up with not much more than gentle gradual inclines, but that doesn't mean that we didn't have to stop every now and again to take a break and just enjoy the beautiful day. Even though we were running behind, we decided to take a slight detour to visit DeCicco's in Ardsley. This was another spot that I had heard a ton of great things about but had never been to. It's a supermarket where they have a huge amount of craft bottles and cans as well as draught beer for growler fills. The selection is simply staggering. 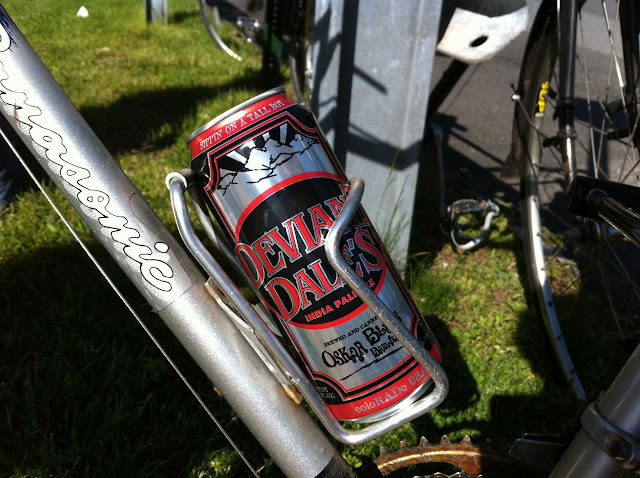 We wanted to get right back on our bikes so we decided to get some Oskar Blues Deviant Dale's which... ahem, just so happened to fit nicely on our bikes. 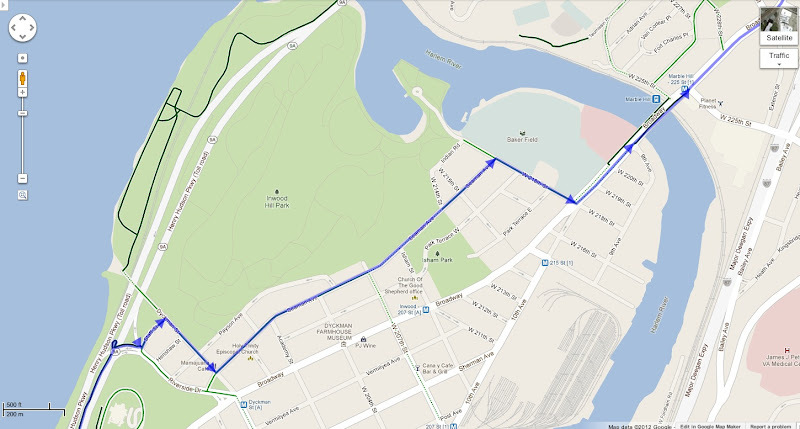 The last segment of the trip is probably the worst as you have to navigate the streets which seems overwhelming after being isolated on a bike path for the previous few hours (Again, see more details in Jeff's bike directions below). Of course the home stretch of riding is on a 2 lane road with no shoulder going uphill, which feels like the summit of a mountain after your long journey. I know I'm alive, but how? We jumped off our bikes and filed through the doors of the new Captain Lawrence brewery to be greeted by Mike Malone, writer of the Notes From the Tasting Room series for the brewery's website. Mike had heard about our journey and wanted to feature us in the column, which is now live on their website, so go check it out! As for the brewery itself, it looks great. It's a lot bigger than the Pleasantville location and has a much better layout. The Tasting Room is really well run and the Friday evening crowd was in good spirits. 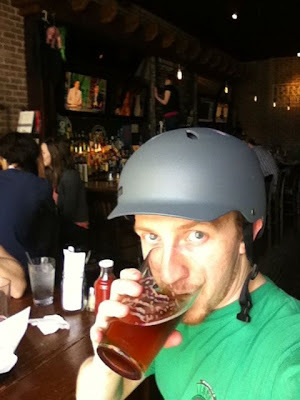 I had to wonder what they thought of three sweaty dudes meandering in, helmets in hand. I restrained myself from shouting that we had just biked there all the way from the World Trade Center and just got some beer instead. While the tasting room has vastly improved from the old location, the real noticeable change in this new facility is the actual brewery itself. It's a huge room with VERY high ceilings and it seems as though there's room for great expansion. You may have noticed that 12oz. bottles of Captain Lawrence beers have started showing up in various retail outlets across the region. Well this sucker above is what's been pumping them out. We hung around the tasting room for about an hour or so, enjoying the free samples and talking with Mike about our experience. We then wrapped it up and completed our final leg from the brewery to the Tarrytown Metro North station. Thankfully for my legs, this was a one way bike ride. 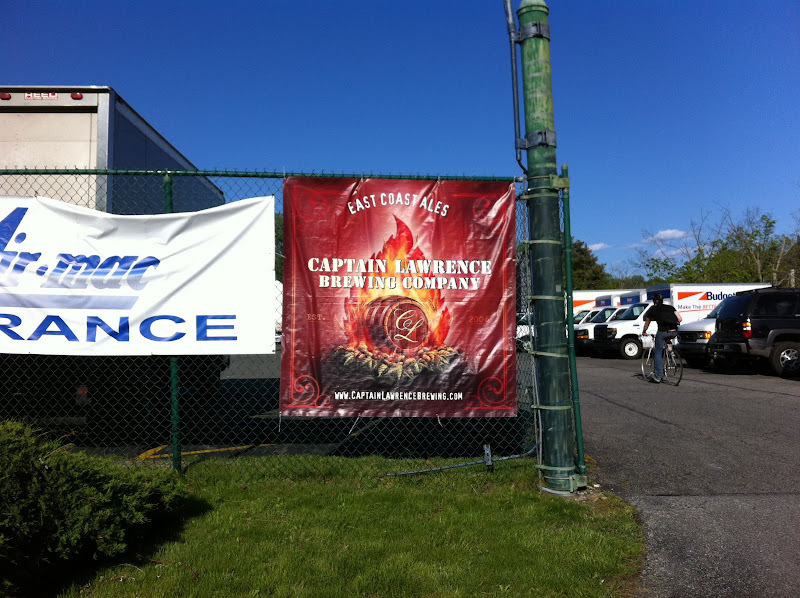 This ride takes advantage of more car-free biking than any ride I could ever imagine.. and it actually goes somewhere useful: Captain Lawrence Brewing Company! 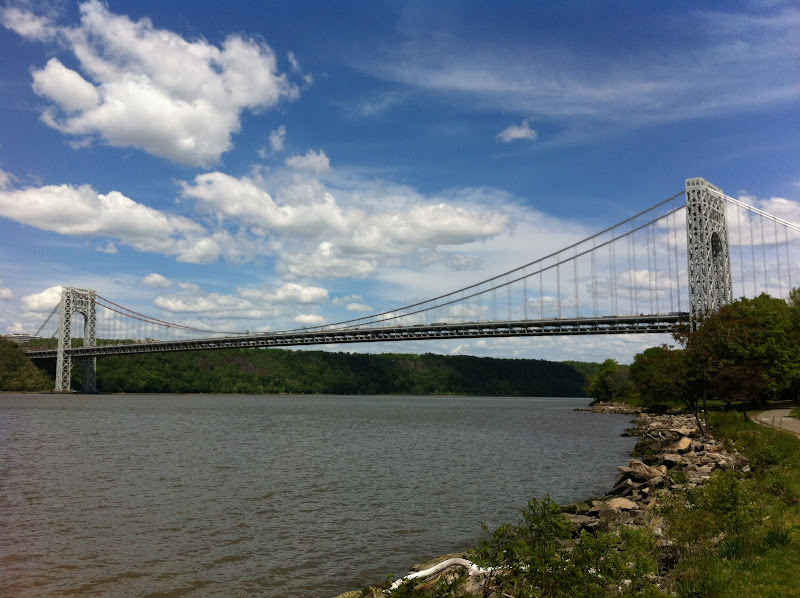 It uses three highly maintained bike-only trails: The Manhattan Waterfront Greenway (Manhattan West Side), The Old Putnam Trail (Van Cortlandt Park, Bronx), and The South Country Trailway (Westchester County, NY). 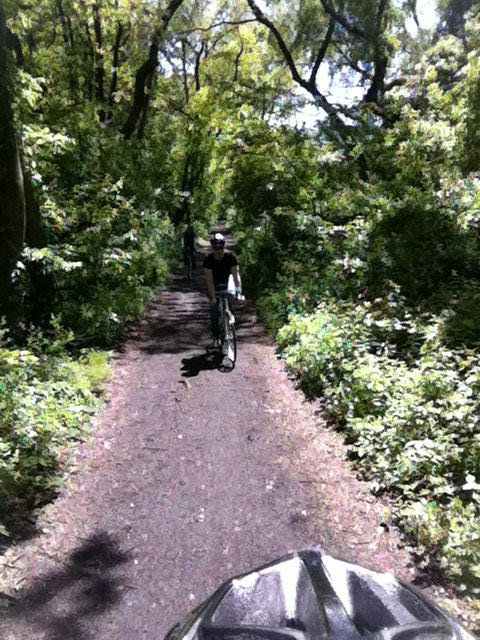 The latter two are converted rail lines and all three are flat and insanely nice to bike on...mostly shaded, green, and peaceful. Linking between them us easy, with the only less-than-luxurious part coming in the last half mile right before you pull into the brewery parking lot. Roughly 35 total miles if you leave right from the World Trade Center. 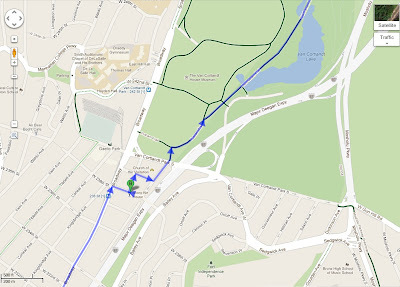 You can follow this complete Google cycling map link here: http://g.co/maps/6aa47 but here’s a quick on-the-ground description of the interchanges you will encounter. 1. First leg is all greenway North in Manhattan. Jump on at any point, and it’s straight as an arrow along the water where the wind is usually at your back. We started at WTC to get the full effect. 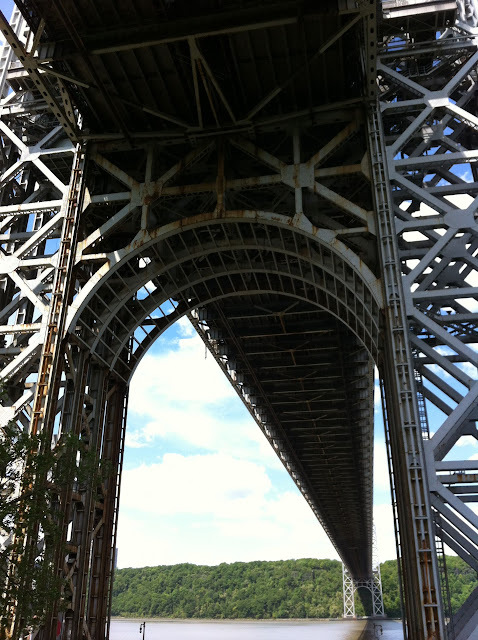 Pass under the GW Bridge and up a gnarly hill that curls up and around and passes under and to the right of a footbridge. Keep going until you hit a set of stairs, and that's where you hit the streets to get to the Bronx. All bike lanes though, so don't worry. This shot above is the best route (same as what Google tells you). 2. Cross the bridge Bronx-bound, and follow Broadway until a Right on W 238th St. One block and the Bronx Ale house is on the right. They have a small bike rack out front, and grab a window seat if you like to keep an eagle eye on your ride. Gonna still need that serious bike lock, sorry! A satisfying lunch and beer later, you're back on your way. Walk your bike the wrong way up Review Pl. (Google doesn’t tell you it’s one-way) and hang a right on Van Cortlandt Park Rd. One more block and dip into the park entrance, at left, across this busy road. You have now entered Van Cortlandt Park. Keep right, go under a small bridge, and then the trail begins with a big rusty old train station overhang hard left. The beginning of the trail is easy to miss, but look left after you pop out under the bridge and you will see the rusty station. Then act like a train and you are on your way. Trail gets muddy in some spots, especially after a heavy rain... but still very navigable on your skinny road tires. That's it... go and go, and then at once it becomes paved and turns into the South County Trailway as you leave the Bronx and enter Westchester County. Small sign will tell you this. 3. Deccico’s! 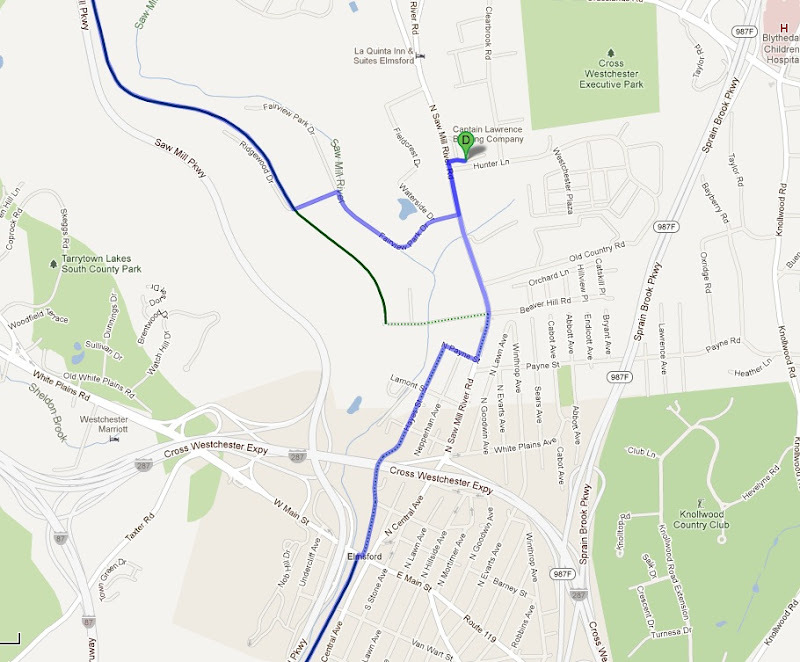 Knowing when to pull off the trail for this detour is tricky for sure, so pull out your smart phone and be checking for Ashford Ave. when you think you’re getting close. When you are, there is a tiny exit on the right that comes just as Ashford Ave appears as a big overpass 100ft in front of you. 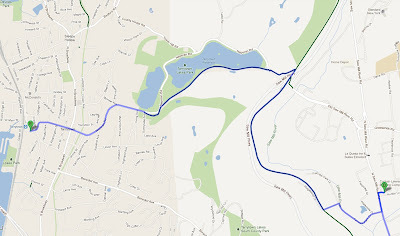 It dumps you into an industrial park of sorts, so go right out of the trail exit nub, and curve around and make a left on Saw Mill River road. 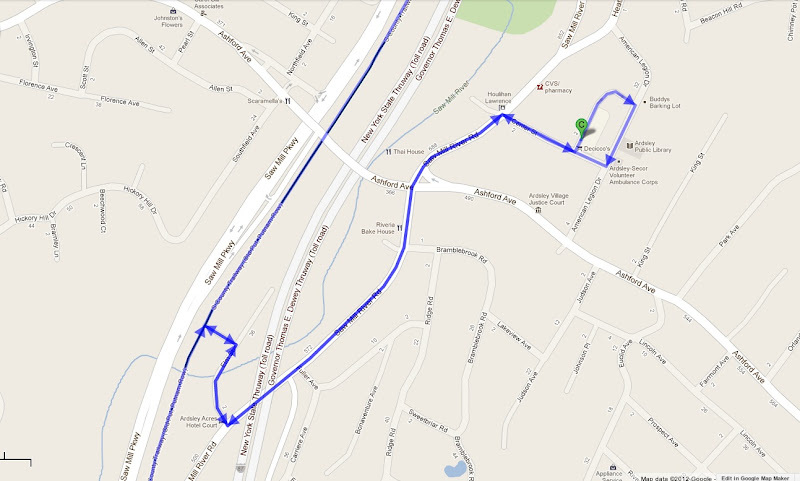 Follow the map and just do an about-face from Decicco’s to head back to the trail. Deccico’s has 400 beers, does growler fills, sells sandwiches and everything else a high-end grocery store would. Nuff said! They have seating inside and picnic tables on a grassy area. 4. Trailway ends! For a little bit at least, and this is where you hit the brewery. Right on Main st, then immediately left on Vreeland Ave. We missed this turn and just got on Central Ave which was pretty hairy car-wise, but still do-able. Vreeland crosses under the Cross Westchester Expressway, turns into Hayes St. Forced to make a right on N Payne St., then left on N Saw Mill River Rd. 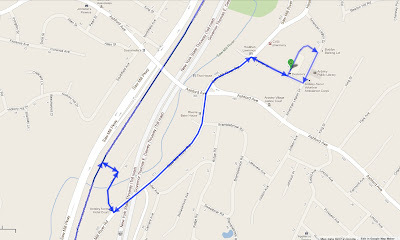 Here is the crappy part of the trip: an uphill and no shoulder for about a third of a mile... sidewalk ends after a bit as well, so just be careful for this quick minute and make a right into the complex AFTER passing Hunter Ln. Drink and be merry! 5. This is where you decide to take the train home. When you leave the brewery, reverse course and its the first right off Saw Mill. Trail begins again after a few turns through an office park. 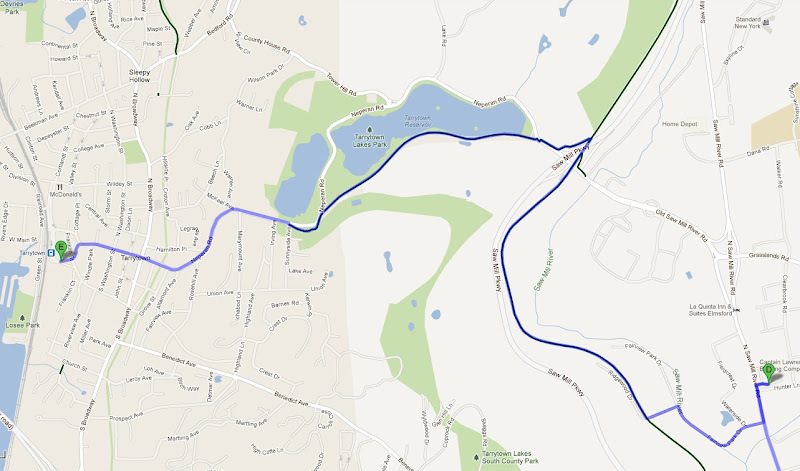 As you see in the map, you will hit an overpass (Saw Mill Pkwy) and then it’s a hard left to keep on the trail section you need to get to Tarrytown. Trail spits you out and its pretty much Neperan Rd. all the way down towards the Hudson River to hit the Tarrytown train station. What you need: Water, flat-tire repair gear, semi-working bike and a few Cliff bars. Fairly isolated at times so come prepared just in case. 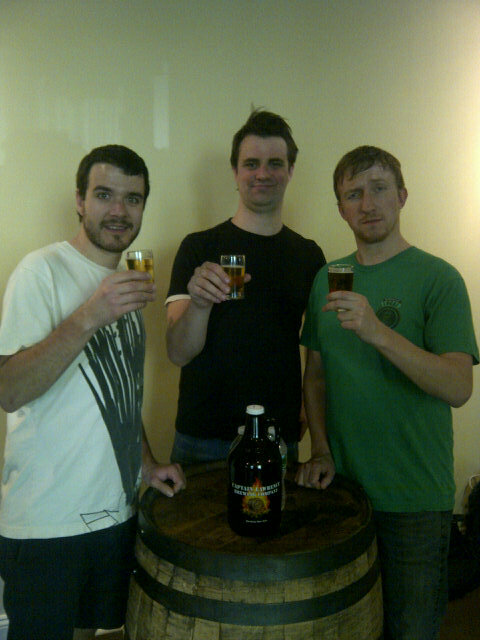 Thanks to Jeff, Pat and Mike for help with the #beertography! The purveyors of the canned craft beer Oskar Blues have teamed with the talented Indiana canners Sun King to create Chaka, a limited release Belgian-style ale. This is landmark event as it's the first time ever that a craft beer has been packaged in a Alumi-Tek re-sealable pint bottle. For those lucky enough to attend the Craft Brewers Conference in San Diego this weekend, they were treated to some Chaka in their hotel rooms. The only other chance of getting your hands on this beer is if you live in Indiana or Colorado, the two home markets of the collaborating breweries. I love the look of these cans. It reminds me of the Coors Light bottles they sometimes sell at sporting events, but this time around there's a worthy beer in the aluminum! We continue our series on Live Sports & Craft Beer today with Beertography's first guest post. Our friend Ceetar is a self-described Optimistic Mets Fan and has been hunting for good beer at Citi Field for a while now. Take it away Ceetar! 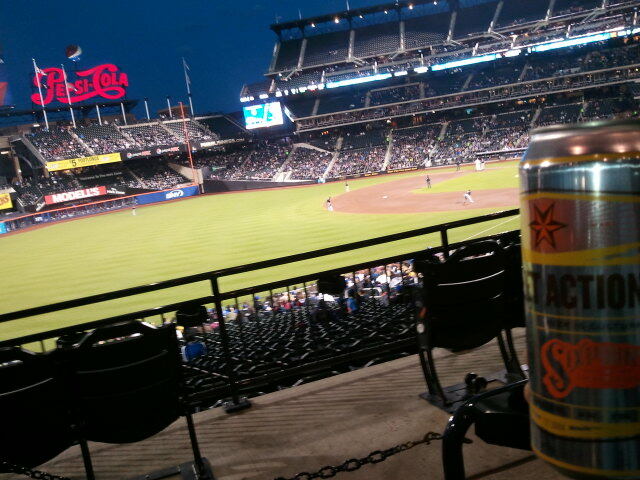 You can find the complete list of beers at Citi Field here: The Citi Field Beer List. The Mets give you a lot of options when you go out to see a ballgame. However the selection probably wouldn't make the playoffs when put up against other stadiums. The standard price is $8.50 for a draft or a can. That's 50 cents more than last year. So let's start at the top. The top is local craft beer, and it's good. The main location to get these beers is what's called the Craft Beer Dugout. There are three of them located near section 413 in the Promenade food court behind home plate, section 127 which is on the Field level near the left field foul pole, and section 105 which is on the Field level near the right field foul pole right near the World's Fare Market. A word of warning, the right field version is severely limited so far. Each of the other dugouts has four taps and a cooler full of cans. The selection so far has been a little different at each one. I've noticed Widmer Drift Pale Ale on tap in left field, but the Widmer tap on the Promenade level was serving the Citra Summer Blonde. Also on tap is Kona Longboard Lager, Shocktop, and Goose Island Honker's Ale. The list of cans includes Sixpoint Sweet Action, Blue Point Summer, Blue Point Toasted Lager, Sierra Nevada Pale Ale, Magic Hat #9, Blue Moon, and Leinenkugel Summer Shandy. I've been told that Blue Point's new White IPA will also be available in cans soon. The other major place to get beer is at Big Apple Brews, which is a giant island of a beer cooler located in center field and in the Promenade food court behind home plate. All of these beers are distributed via the Anheuser Busch/Craft Brewery Alliance agreement, but there are some pretty good beers included in that. I usually stick to the offerings of Goose Island, Widmer, and Redhook, but you can see the complete list here. So that's the list. I believe that comes to 64 different beers at Citi Field, although a large chunk of them are different varieties of the macros. I'd give Citi Field a solid B grade. It's certainly got a couple of good beers, but there is still work to be done. I'd like to see more Sixpoint offerings besides just Sweet Action, and more Ommegang particularly in the publicly accessible areas. There are quite a few other local/NY breweries that I'd love to see too. Captain Lawrence, Ithaca, Chelsea, and Southampton to name a few. That doesn't even touch on the New Jersey offerings. I still lament the loss of the four specialty Brooklyn Brewery beers that were paired with the Danny Meyer concessions out in center field. Losing those after the 2010 season was definitely a big blow. If you want a beer before the game, your only option is McFadden's Citi Field located by the center field/bullpen gate. I haven't been in a while but it has the same beer list as pretty much every other McFadden's and while it's not horrible, it's not much to write home about. You've got Guinness, Sam Adams, Blue Moon and another 10 or so taps of the usual cast of characters. Thanks Ceetar! You can check out and follow Ceetar the Optimistic Mets Fan on Twitter!